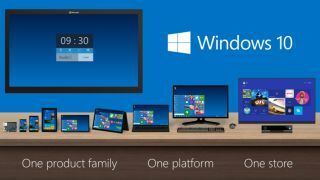 Microsoft's CEO, Satya Nadella, has provided more details about the next iteration of its flagship OS, Windows 10 at Gartner's Symposium ITxpo. Intriguingly, the Internet of Things (or IoT) emerged as one of the most commonly used terms during his speech at the event. "Windows 10 is a very important step for us." he said, "It's the first step in a new generation of Windows as opposed to just another release after Windows 8. General purpose computing is going to run on 200 plus billion sensors. We've architected Windows where it can run on everything." The polymorphism exhibited by Windows 10 has yet to be detailed but it now appears clear that Windows 10 will run on x86 and ARM at the very least; expect it to be equally capable of handling heterogeneous systems (CPU+GPU or ambidextrous-type systems). Windows 8 for IoT is currently free and Windows 10 for that ecosystem is likely to cost zilch as well. Microsoft unveiled Windows 10 on 30 September at an event that saw the technical preview demoed and then subsequently released to an armada of beta testers.